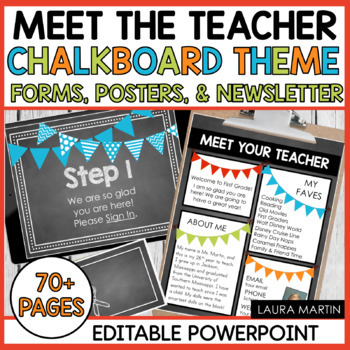 Back to School is easy with these EDITABLE Meet the Teacher Chalkboard powerpoint templates, informational forms, wish list cards, and newsletter templates! Set up stations or use as a presentation! 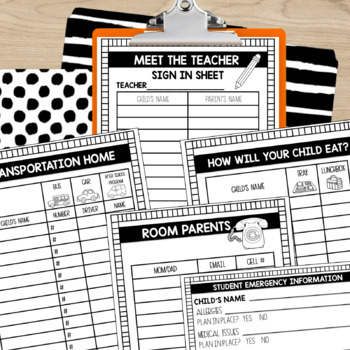 Customize your Open House with these EDITABLE files: in color and black and white -OR- use the ready-to-use posters provided. "I absolutely loved this set up!!! I went with a different theme this year, but I will probably go back to this one next year, it was so clean and crisp! I loved it!" "Super easy to edit. So glad I bought this! 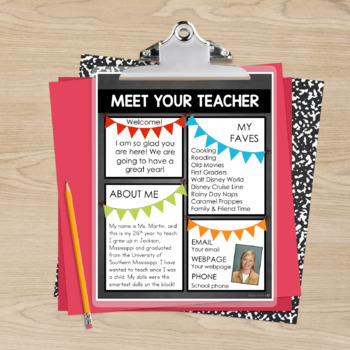 Made my meet the teacher super cute!" Read my Meet the Teacher blog post here! 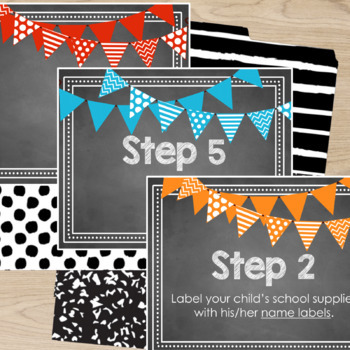 Don't forget to leave feedback and earn credits toward FREE TPT purchases. I appreciate your feedback so much and read every single one! Want to be notified when new products are posted? Hit the FOLLOW Button above! New products are 50% off the first 24 hours they are posted. Please let me know if you have any questions about my products! I hope you and your kiddos love this pack! !